A recently proposed mesoscopic mean-field theory of mammalian cortex electro-rhythmogenesis describes the salient features of electrical activity in the cerebral macrocolumn, with the use of inhibitory and excitatory neuronal populations . Numerical solutions to the defining non-linear equations have revealed two interesting emergent phenomena: i) the appearance of large-scale spatial coherent 40 Hz oscillations in the model cortex, which has shown to be experimentally related to cognitive activity , and ii) a surge in spectral EEG power – when the brain is subject to general anesthetics – as a function of their concentration , a clinically established effect known as the "biphasic" response. 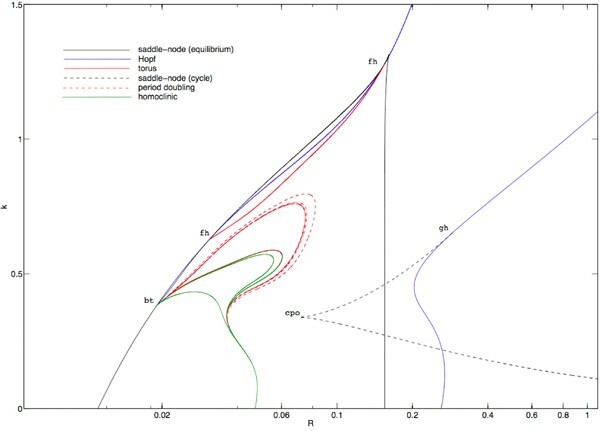 Given that quasi-linear approximations have been unable to capture the dynamical mechanism that trigger these phenomena, a bifurcation analysis  of physiologically relevant parameter sets was performed. Because of the predicted importance of inhibitory-inhibitory population strength in determining many fundamental dynamical features of the model, bifurcation parameters were chosen that modified inhibitory post-synaptic potential amplitudes and anatomical coupling strengths of the inhibitory neural population (respectively R and k in Figure 1). The analysis revealed the existence of a pattern of recurring bifurcation diagrams and specific "phase" transitions that constitute the dynamical requirements for the genesis and unfolding of 40 Hz and biphasic behaviors. This result also reaffirms the relevance of inhibition for the genesis of global collaborative events in the cortex and sheds light on the organization of the parameter space and the variability of EEG in the model respect to those perturbations and collective responses that are physiologically admissible. An example of codimension two bifurcation plots for a parameter set displaying coherent gamma oscillations. The right-most branch of Hopf points corresponds to the emergence of approximately 37 Hz limit cycle activity via a subcritical Hopf bifurcation above the point labeled "gh" (generalized Hopf). Also, a homoclinic doubling cascade takes place along the line of homoclinics emanating from "bt" (Bogdanov-Takens point).